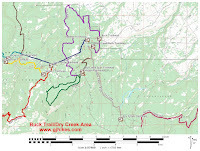 The Dry Creek Spur trail is located in the Plateau Division of the Uncompahgre National Forest near Montrose, Colorado. The trail begins off of the Divide Road where it travels across the plateau for almost a half mile before descending a rocky trail into the Dry Creek drainage where it comes to an end at a junction with the Dry Creek trail. Enroute it is connected to by the Buck Trail Spur. To get to the trailhead follow Highway 90 for about 23 miles from the center of Montrose and turn left onto Divide Road. Follow Divide Road for another 1.7 miles where the trailhead will be on the left. Another route would be to follow the Dave Wood Road from Montrose to the Divide Road. The trail starts out by passing through a trail squeeze the limits the width of ATVs to 50 inches or less. Once through the trail squeeze the trail continues toward the edge of the plateau. The trail is pretty level up to the half mile point where it begins a long descent into the canyon. The elevation profile show how the trail only loses a little elevation until it reaches the half mile point and how it picks up afterwards. As the trail drops into the canyon there are berms across it that were put there to make water run off the side of the trail and not cut a trench down the middle of it. We were riding down this on mountain bikes and the berms came in handy for keeping our speed under control. If you look closely at the photo you can see that there are a lot of rocks on this part of the trail. 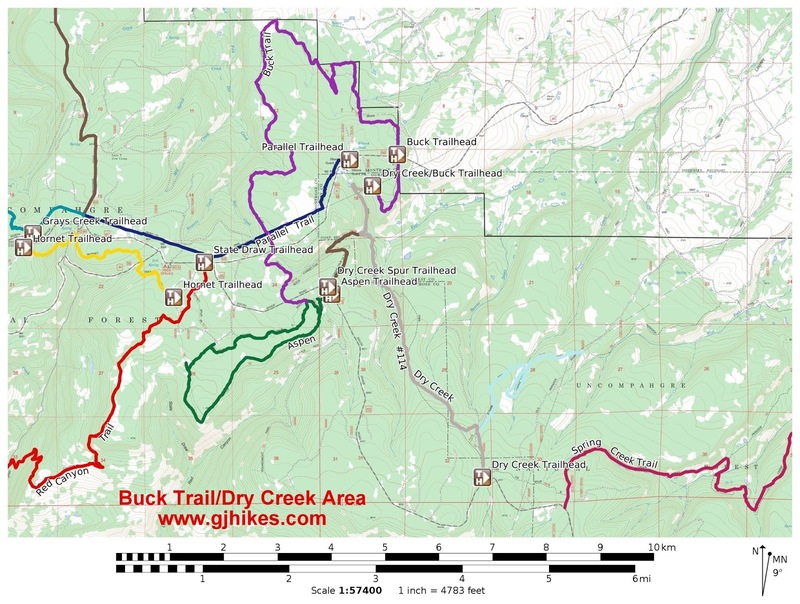 At the 3/4 mile point the Dry Creek Spur comes to a big switchback where the Buck Trail Spur connects to it on the left. This photo of the switchback that was taken from the Buck Trail Spur gives a better idea of how steep the trail is. If it weren't for all the rocks it probably wouldn't have seemed as steep. A little past the switchback the trail smooths out and it isn't quite as steep as before. At the bottom of the hill the trail meets up with the Dry Creek trail and comes to an end. From here it is right at 1 mile to the left up to the Dry Creek/Buck trailhead at the end of Forest Road #560. The climb out of the canyon to get back up onto the plateau is only moderately difficult. Mountain bikers shouldn't have any trouble riding it all the way. There's a nice scenic lake to stop by for a rest along the way. The only other people that we saw on the Dry Creek Spur trail were all riding in ATVs. We spoke with several of them and they seemed to be really enjoying the trail. If you would like to see it for yourself then all you have to do is 'Take a hike'.